In autumn 2010, seven prominent Indian thinkers – Ashis Nandy, Dipesh Chakrabarty, Sarat Maharaj, Homi Bhabha, Partha Chatterjee, Sarat Maharaj and Tejaswini Niranjana – were invited by West Heavens to Shanghai and gave a series of lectures for the first time in modern Chinese history. Making use of the 8th Shanghai Biennial as a public platform, they met Chinese audiences and intellectuals at the Shanghai Art Museum and in universities in Shanghai and Hangzhou. The unprecedented series, West Heavens: India-China Summit on Social Thought, was described as the most significant intellectual event between India and China since Tagore’s visit in 1920s. More than 30 scholars and artists from China, Taiwan, Hong Kong, Singapore and South Korea participated in the series and contributed to the conversations. 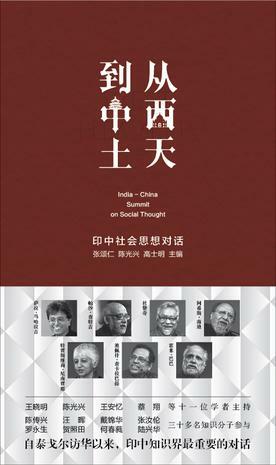 West Heavens: India-China Summit on Social Thought is now published in book form by the Shanghai People’s Publishing (January 2014), collecting 14 keynotes speeches which covered topics as wide ranging as visual arts, globalization, modernity and nationalism. It also includes a selection of responses and interactions generated by this inaugural project of West Heavens. A record, a memoir and an archive, this book is a springboard for further interactions and a vehicle for deepening understanding between Chinese and Indian intellectuals as well as an important resource for anyone interested in the two countries.